This traditional French dessert should be perfect with cherry vanilla or vanilla ice cream. Place the cherries in a small bowl and toss with the kirsch. Let macerate for 1 hour. Preheat the oven to 450 degrees. Grease a 9-inch round baking dish with the butter and coat with a pinch or two of the sugar. Place the pan in the refrigerator. In a large mixing bowl, beat the eggs with a whisk, then add the sugar and beat well to fully incorporate. Mix in the flour and the vanilla extract, stirring enough so that all the ingredients are homogenous but without overworking the flour. Using a rubber spatula, fold the cherries and their accumulated juice into the flour and egg mixture, then pull your prepared baking pan out of the refrigerator and turn the mixture into it. Bake for 30 to 35 minutes, or until a golden brown crust has formed on top. A testing skewer inserted into the center should come out clean, not wet. Using a small strainer or sifter, dust the top with confectioners’ sugar and serve. Culinate editor's note: This clafoutis — essentially a baked custard-cake — is on the firm and dry side. 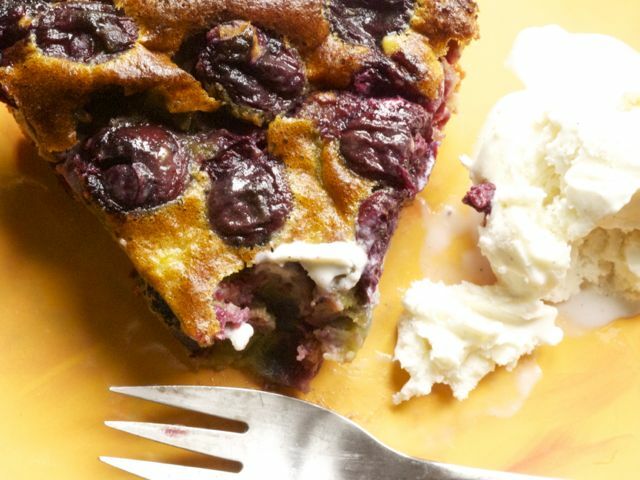 For a moister clafoutis — the kind you're likely to find in French patisseries — try Almost Classic Cherry Clafouti. And for a jiggly, truly custardy clafoutis, make Blueberry Clafoutis.